1. Heat the butter in a large pan and gently cook the soffrito mix for 3 minutes. Rinse the frozen mushrooms, add to the pan and cook for 2 minutes. 2. 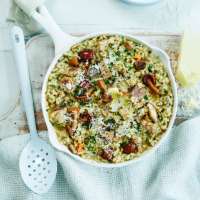 Add the risotto and a splash of water to the pan and cook gently for 8 – 10 minutes, stir regularly and add more water if needed, until the rice and vegetables are tender. Stir in the parsley. 3. Divide between shallow bowls and serve with a sprinkle of cheese and good grinding of black pepper.